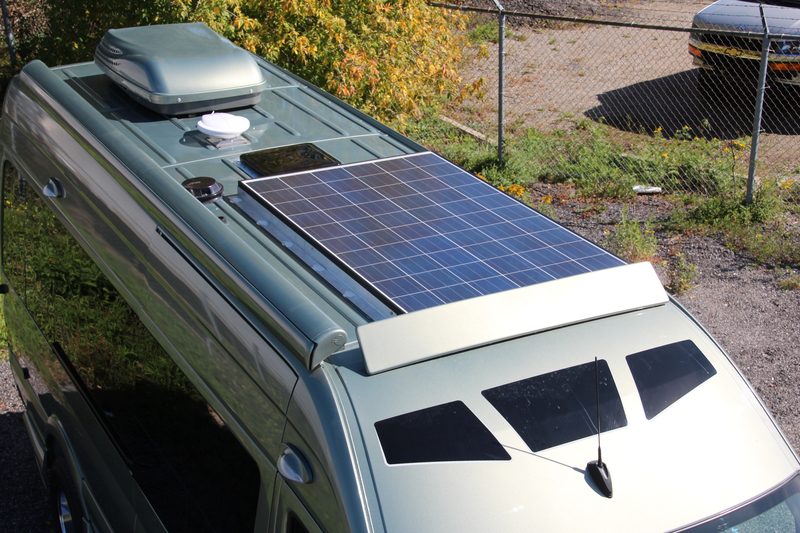 Camping off the grid: A solar power package is now available for RoadTrek motohomes. Courtesy photo. Innovation is one of the things I look for every year when the outdoor show season opens in Michigan. There are 13 shows on the lineup this year. They start next weekend in Novi with the Ultimate Fishing Show Detroit and wrap up at the end of March with the Ultimate Sport Show Grand Rapids (See the full calendar on next page). The show season typically has something for everyone, and cool innovations can turn up at any of them. Take, for instance, alternate energy technology. Solar panels and other power management technology has been around for decades. It long has been used by sailors to extend voyages and eliminate the need to plug-in every night to charge batteries. But this year some of those ideas are trickling down to the RV industry, better known for bloated energy and fuel consumption. A promising new approach will debut at the Grand Rapids Camper Travel Show opening Jan. 17 at DeVos Place. RoadTrek Motorhomes Inc., a Kitchener, Ontario-based manufacturer is introducing its E-Trek package, a propane-free and external generator-free system for running the refrigerator, hot and cold water, shower and stove. It has no propane tanks to fill, less need to plug in each night, and no noisy, external generator to provide power when camping. The company bills its E-trek motorhome as environmentally friendly. It clearly is a step in that direction. The E-trek package is available on the popular RoadTrek, Class B motorhome, which also can burn biodiesel fuel. It is a sharp-looking vehicle that uses recycled materials in its tables and countertops, too. The E-trek approach is smart — and cool. If it performs as suggested, campers can skip the campground altogether. Anglers can pick a great spot by a river, fish until dark and then crash in comfort. Hikers can spend the night in some remote area without worrying about running out of juice. Rafters can spend the entire day running whitewater and return to full power, air conditioning included. Another innovation — a motorized tree stand that moves up and down a tree at the push of a button — will be at the Huntin’ Time Expo Jan. 24-27 at the Delta Plex in Grand Rapids. The device is called the TreeRider. Its Georgia-based inventor, Tony Moran, who was featured in December on the History Channel’s Invention USA show. The TreeRider likely will change the world for disabled and older hunters and make life a lot easier for those who are well and able to climb otherwise. “This is exciting and huge,” said Tom Antor, the Huntin’ Time Expo producer. Antor’s show added a fourth day this year. The show opens at 3 p.m. on Thursday, Jan. 24, rather than on Friday as it has in past years. Antor’s Huntin’ Time Expo features, how-to workshops, taxidermists, deer displays, gun auctions and even a Puppy Alley where breeders can come and sell their young hunting dogs. Moran, its inventor, demonstrates how quick it can be set up, its smooth and secure ride up and down a tree carrying a hunter and his or her gear, and its use after a hunt to lift a deer so it can be loaded onto a pickup. The device comes with a solar cell to charge its batteries while sitting in the tree. It also comes with outlets for electrical devices such as cellphones and radios. The 3,500-pound capacity winch handled a 300-pound hunter without a hitch on the History Channel’s televised episode. The TreeRider and E-trek motorhome are just two of the many new products being shown this year, but they are two of the more innovative developments that are likely to foster change. But don’t just take it from me. There are plenty of shows to browse and enjoy. See for yourself. At right is a quick list of the shows that are planned and where you can find out more about them. Jan. 17-20: Grand Rapids Camper, Travel & RV Show, DeVos Place, Grand Rapids: showspan.com. Jan. 24-27: Huntin’ Time Expo, The Delta-Plex , Grand Rapids: huntingshows.net. Feb. 21-24: Outdoorama — Suburban Collection Showplace, Novi: showspan.com. Feb. 22-24: Michigan Deer & Turkey Spectacular, The Summit Sports and Ice Complex, Dimondale: deerinfo.com/michigan. March 9-10: Midwest Fly Fishing Expo, Macomb Community College, Warren: midwestflyfishingexpo.com/. March 21-24: Ultimate Sport Show Grand Rapids, DeVos Place, Grand Rapids: showspan.com. This entry was posted in Uncategorized and tagged Archery, Calendar of Shows, Camping, Fishing, Gear, Hiking, Hunting, Innovation, Motorhomes, Outdoor Shows, Paddling, Solar Power, Tree Climbers. Bookmark the permalink.